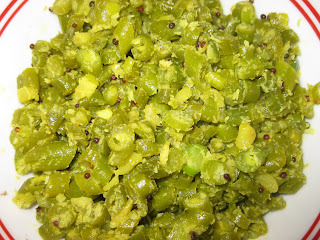 I have already published fried bitter gourd pickle. In this I used raw bitter gourd and its taste is slightly different from the fried pickle. 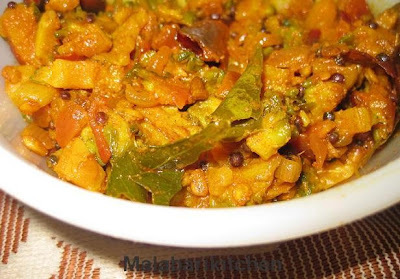 =►Clean and cut bitter gourd into small pieces. =►Heat 3tsp of oil in a pan, put mustard seeds and allow it to crack. =►When it cracks add dry red chilies, fenugreek seeds, sliced shallots, ginger, garlic, curry leaves into it. =►Then add bitter gourd pieces, turmeric, chilly powder and mix it well. =►Saute it everything well and cook it for 5-6min and add ¼ cup of vinegar into it. =►Allow it to cook for 2-3min and switch off the flame. =►Add ½ tsp of hing on over this pickle and serve it after 2-3 day. Wow,a new pickle to me...looks awesome. 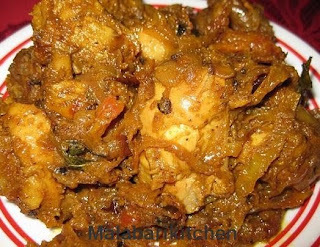 You are expert in achar making. This pavvaka acchar is delicious. I love bitter gourd .